Every door along a building's egress path is considered an egress door, including doors that lead to an exit. An egress door is an exit designed to allow safe evacuation from a building during an emergency. An egress door is an exit designed to allow the occupants of a building to evacuate safely during an emergency. 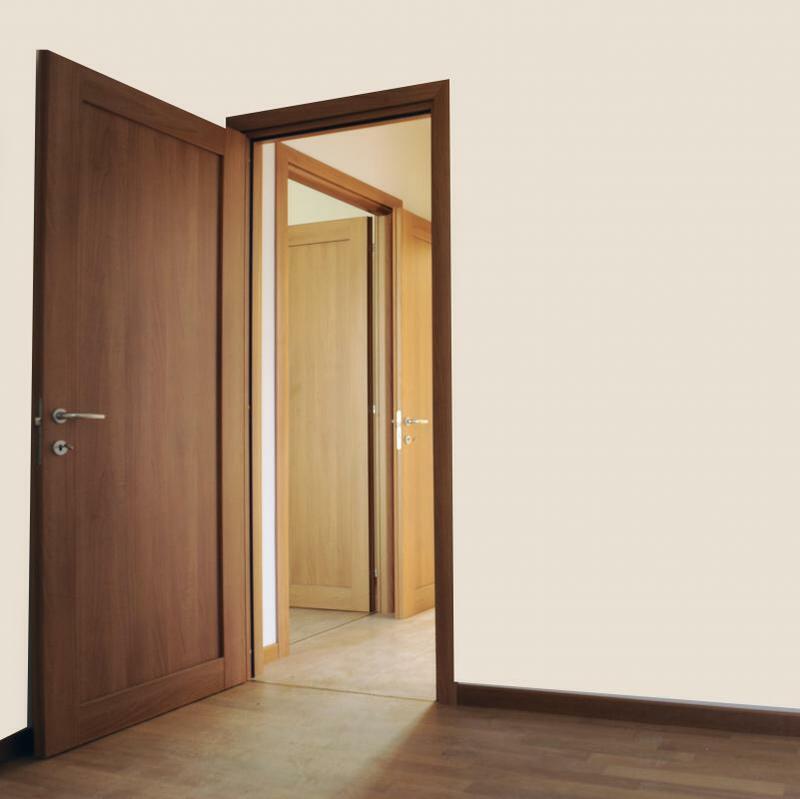 In most countries, such doors are regulated by local building codes, which stipulate how many doors are required and the requirements for each exit. In the United States, most building codes relating to these doors are based on standards developed by the National Fire Protection Association (NFPA). NFPA Standard 101 stipulates have an egress door should be operated, installed and controlled. The NFPA guidelines are based on the building's function and occupant load, as well as on the presence of hazardous or combustible materials. 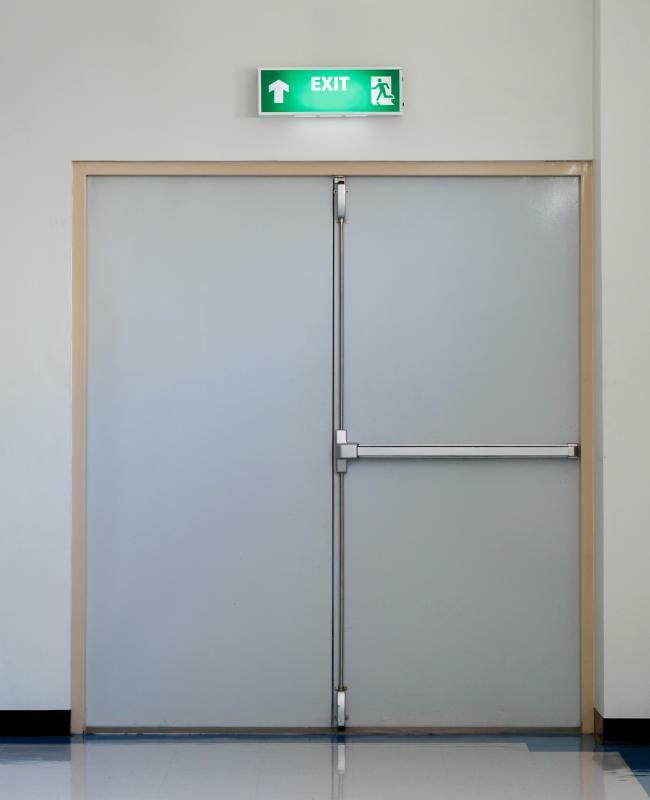 According to NFPA 101, an egress door is not limited to simply exit door that leads outside. Instead, every door along the building's egress path is considered an egress door. This includes doors that lead from various rooms to the exit, such as office or hallway doors located throughout the building. It also includes doors leading to an exit, which often includes stairwell or lobby doors. Finally the exit door itself, which allows occupants to move from the building to a public space, is also considered an egress door. It's important to understand that NFPA standards are not a law in and of themselves. Once they are incorporated into a building code however, they become legally binding for architects, contractors and building managers. Historically, the NFPA update its standards at least every three years, but there is often a delay before the newest version is adapted by each state or municipality. An egress door must meet specific requirements before the building is approved by the local fire marshal or building inspector. All such doors must be at least 32 inches (81 cm) wide in new buildings, or at least 28 inches (71 cm) wide in existing structures. 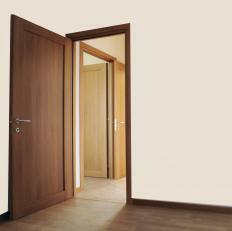 No single exit door can be wider than 48” (121 cm) because the size and weight of the door may slow evacuation. The door must also swing in the direction of egress if the building has more than 50 occupants, or if the building is at a high risk for fire emergencies. When it comes to securing an egress door, all locks must be unlockable using a single motion from inside the room. This means that a separate deadbolt and latch are not acceptable, as they would require more than one action to unlock. Double-sided deadbolts are also unacceptable because they can not be unlocked from inside the space at all times. All locking devices must permit re-entry into the building from a stairwell, and no chains, bolts or bars may be placed on the door when the building is occupied. An egress door is not the same as a fire door. A fire-rated opening is designed to reduce the spread of flames and smoke during a fire. It is equipped with a fire-resistant core and specialty hardware to ensure it stays closed and latched during a fire. 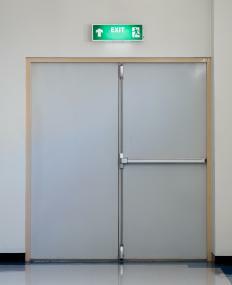 Egress doors are designed to allow for quick and safe egress during any type of emergency. They may or may not be fire-rated, and are used to allow as many people as possible to exit without panic or injury. What are Basement Egress Windows? What is the rule if I have double doors leading out of a manufacturing facility into a corridor, then at the end of the corridor there is an additional set of double doors that leads to a vestibule. The egress door leaking from the vestibule is a standard 36" door. My questions are: Are the two sets of double doors, corridor and vestibule considered my egress route? Do I have to keep the path as wide as the double doors, specifically the path leading from the manufacturing floor through the first set of double doors.